I got Gus, our first Boston Terrier, in part because I wanted to explore the small dog experience. When he died, we continued this experiment by getting Bud from a rescue group with a branch in Arkansas. I saw the great affection people had for smaller dogs, and I was also aware are small dogs now outnumber medium and large size dogs in America, they are the most popular dogs for people to purchase or acquire now. I am understanding the allure. First off, smaller dogs are…well…small. They require less exercise, don’t need to run and walk as much, they work well in the smaller homes and apartments that many Americans are now living in. They tend to be bright and full of personality. They fit in small spaces – on laps, on couches, in bed. The two small dogs I have lived with think they are large dogs, they have no sense of being vulnerable. They are very affectionate. They love to sit up against people, press against them. My small dogs naps on my stomach when I nap. He sleeps curled up in a ball between Maria and me. He is very much a family dog, he seems to love every dog and every person. He loves to ride around town with us, he takes up no space and is very serious about studying the town, it’s people and dogs through the car windows. These small dogs are agile, they can hop up on to chairs, sofas, into cards. They can slip out of the house between my feet in a flash, they always want to com along. I am learning to understand why the big men in trucks love them so much, they fit snugly into one’s life, offer affection continuously, and bristle with personality. I am impressed with Bud, he is teaching me about small dogs like Boston Terriers. The are impulsive and independent. They are flatulent and strong-willed. They are local and home centered. Everything in the house – every toy, chair and sofa – is theirs. They are often so ugly as to be cute. They make us laugh. That’s about as far as I have gotten. I’ll keep at it. I am so happy that your began your small dog experience with a Boston. They have been my life since I was a wee one. They are so intelligent that sometimes I know they can read my mind and know my thoughts. they are such sweet and dedicated caregivers – to humans and to other animals. Your love will continue to grow with Bud. I miss Gus. I love your essays on the small dog experience, Jon. The only thing I found to be unexpected with small dogs is the exercise requirement. A bichon or pug can get by with short walks but a Jack Russell’s need for exercise is insatiable. If I had known that beforehand, I might have purchased a Great Dane couch potato instead. Live and learn… Thanks again for your wonderful blog, Jon. It’s one of the highlights of my day and always makes me smile. “They make us laugh” belongs at the top of the list. It’s my dog’s most important job, and I’m happy to say she does not take it seriously. Jon, I think Bud came when Red needed him. That fierce boy who doesn’t back down. How did that happen with such a small dog? Amazing. Welterweight dog! I really love this picture. I have been a Boston fan for nearly 50 years. I have been blessed with 3 of them in my lifetime. Currently, I have a Frenchie. 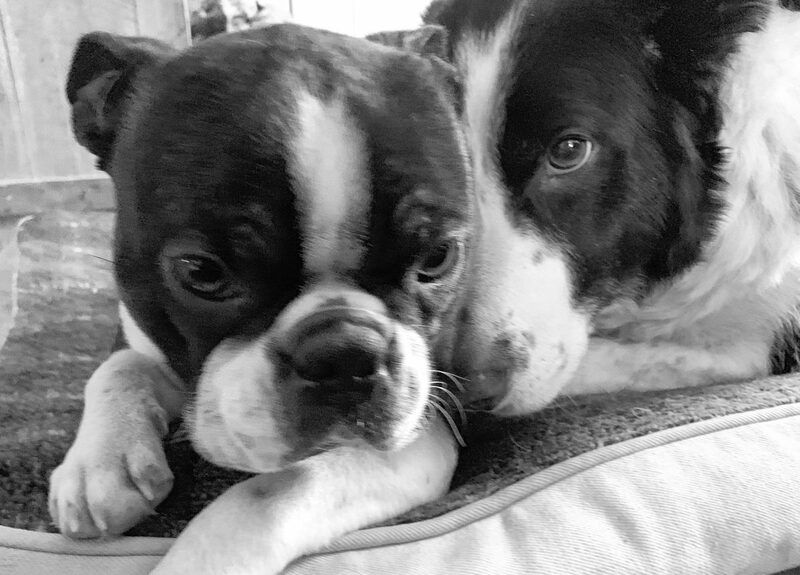 They are adorable, but not as high spirited as the Boston.